Letter accompanies a folder of Harris who is a bright little fellow, thanks her for some leaflets especially "A Home Prayer", and thanks Mrs Brewster for her help and interest. 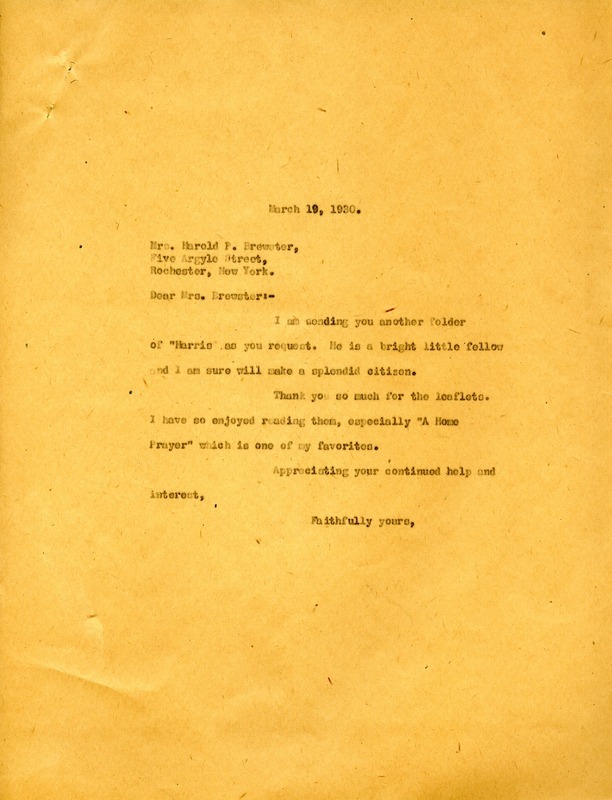 Martha Berry, “Letter to Elizabeth H. Brewster from Martha Berry.” Martha Berry Digital Archive. Eds. Schlitz, Stephanie A., Sherre Harrington, Chelsea Risley, Alan Henderson, et al. Mount Berry: Berry College, 2013. accessed April 23, 2019, https://mbda.berry.edu/items/show/11869.